About this object A three term Speaker of the House, Frederick Gillett of Massachusetts resigned from the House to serve in the Senate. Republicans increased their House majority and maintained their Senate majority after the 1922 election. 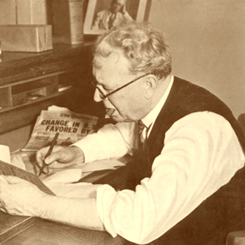 The 68th Congress (1923–1925) reorganized the Veterans’ Bureau and established the Foreign Service. It passed the Federal Corrupt Practices Act, which set campaign finance law for almost 50 years. Congress overrode President Calvin Coolidge’s veto of veterans’ compensation. It also revised the immigration quota system to favor those of western European origin and completely exclude Japanese immigrants. 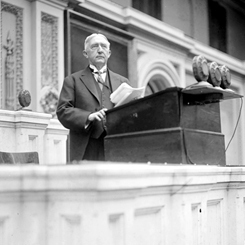 On this date, Dr. Edwin Anderson Alderman, president of the University of Virginia, addressed a Joint Session of Congress memorializing his close friend, the late President Woodrow Wilson.